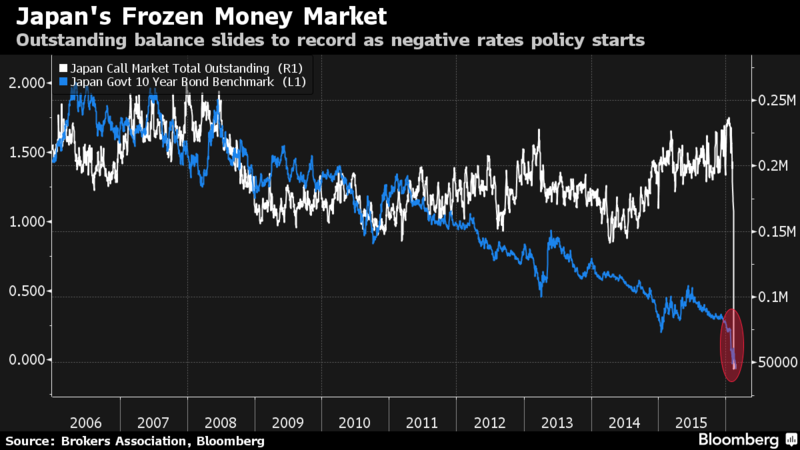 And now, the canary in the global economic coal mine is squawking about something else that is about to be felt around the world, negative interest rates. It has often been said (and rightly so) that Japan is in many ways the canary in the coal mine of the global economic collapse. An utterly insane bubble of market insanity directly blown by the central bank? Check. The sudden and cataclysmic popping of that bubble? Yup. A rush to prop up the “too big to fail” banks by papering over their credit defaults with government promises (at taxpayers’ expense, of course)? Old hat to the Japanese. An extended period of zero interest rates failing to ever deliver the perpetually promised “liftoff” from a stultifying, decades-long deflationary spiral? Been there, done that, got the t-shirt. And a dying, shrinking, aging population facing a demographic winter of discontent from which there is no escape? It’s now official! In every way that matters Japan has been “leading the way” for decades. “Leading the way” by showing others what a post-bubble nightmare of zombie companies and endless deflation and deleveraging looks like, anyway. Recent reports of safes selling out at major retailers in Japan are just a sign that an old Japanese custom of stashing cash at home (tansu yokin, or literally “wardrobe savings”) is now expanding thanks to Kuroda’s negative interest. Japan’s notoriously conservative banks are aggressively selling off their government bonds (dumping $625 billion worth in the last three years) and aggressively lending whenever and wherever they can (with Japanese banks now the biggest cross-border lenders in the world). The Bank of Japan continues to furiously gobble up Japanese debt through its “QQE” (Quantitative and Qualitative Easing) programs, with the 10 year government bond just having crossed into negative yield for the first time ever. Just to put that in perspective, the freezing up of the overnight repo markets was one of the key harbingers of the Lehman collapse. So, how is the Japanese canary in the coal mine doing, you ask? Well, to put it in the parlance of Monty Python, this is an ex-canary. But don’t worry, everyone, a group of Japanese banks and tech companies have formed a new initiative to trial blockchain technologies for international remittance. Deck chairs on the Titanic, anyone? And speaking of the Titanic, I’m sure we can all feel assured that the unsinkable ship of the global economy is being steered by the same gaggle of central bankers that helmed us into the 2008 iceberg. But then again, that was the plan all along. Let them run their system into the iceberg and try to scoop people up in their phoney lifeboats. We have our own solutions.